Home Business Does Buddha belong in the work place? Does Buddha belong in the work place? A Buddhist monk and a CEO of a corporate enterprise, might have had little in common a few decades ago. What reconciles their differences? Mindfulness. Many regard Thich Naht Hahn as the master of Zen Buddhism who bought mindfulness to the West, but whether its authenticity survived the journey is still up for debate. It is both a strength and weakness of the human mind that it greets alternative ideas with caution. Many cynics see the Western practice of meditation as a means to fuel productivity that has little to do with ancient wisdom. In the corporate world, using techniques in order to maximise profitability of workers is not unprecedented. First it was after work drinks, now it’s before work contemplation. As mindfulness is being used by the NHS as an alternative to medication, and regular practice is linked to positive effects on physical health, can meditation have the benefits in business that it has on personal life? It’s easy to laugh at an image of a suited business man indulging in the apparently whimsical pursuit of spirituality. But we often use humour to resist belief systems that differ to our own. People can get attached to thought patterns, irrespective of whether they are positive or not. Busyness, stress and anxiety pose problems for our mental wellbeing, but sometimes we enjoy the comfort of their predictability. This, paired with the commodification of Buddhism, with apps like ‘Headspace’ that made two monks into millionaires, can make it difficult not to be sceptical. A recent piece in The Economist, argues that the West is doing more to manipulate Eastern mysticism for their own ends, than ancient spirituality is to change modern behaviours. Before we debunk the use of mindfulness in the work place, we should also remember that we are perceiving it through our own filter of belief. Studies that conclude meditation at work can lead to higher productivity and efficiency don’t focus on the shift in attitude mindfulness can bring to employees. A positive correlation between well-being and profitability is not mutually exclusive with the cultivation of compassion and awareness for others. There are many other benefits that mindfulness can bring to commercial environments that have not been tested by psychological experiments. 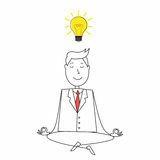 The Economist has since concluded that executives are becoming better leaders, and not just better pioneers for productivity, through mindfulness training. The extent of compassion cultivated towards fellow workers and customers, is something that is underrepresented in the sceptics’ opinion on Google’s true reasons for swapping free bars for meditation rooms. Scepticism is an admirable trait. In evolutionary terms, it safeguards our interests in the decision making process, helping us to assess situations critically. But, as Buddhism teaches us, we should learn to let go of the things that don’t serve us anymore. And being sceptical of the intentions of companies in holding meditation classes for their workers, does little for the future of compassionate business. Only when we let go of the grip on our own belief system, can we start feeling the benefits of absorbing another.